Business Address: College RoadCity: RawalpindiState: Business Email: [email protected] Contact Numbers: +92 302 5039540, +92 51 5762090Business Description: GOHAR Publishers is located on College Road, Rawalpindi. It provides all kind of publishing and printing services. 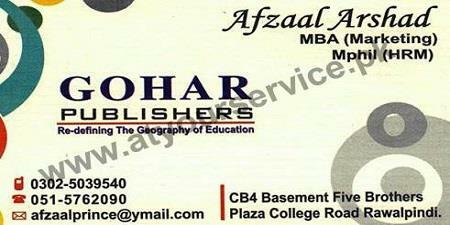 GOHAR Publishers is located on College Road, Rawalpindi. It provides all kind of publishing and printing services.